Sometimes getting ready to go out can take time. Alfie’s dad can be a little impatient, “Hurry up, Alfie!” But this time it seems that Alfie knows better than Dad, just what clothing is required for a day out in the park. This is an energetic and engaging book about the procrastinations of one child, and the patience and exasperation his father. It is a scenario many parents – and their children – will recognise and is told with simplicity and humour. It is a joy to read. I love Walker’s illustrations; they are busy and lively as Dad tries to keep up with his little crocodile who whizzes around on his scooter, tries to do headstands, and plays with the cat. The details are quirky with lots of little surprises and the pictures portray a beautiful relationship between the father and son. 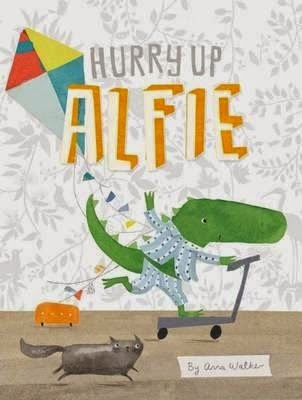 Hurry up Alfie is a warm story which will be shared with many laughs between parents and pre-schoolers.